Club Penguin Cheats by Mimo777 Club Penguin Cheats by Mimo777: Club Penguin Magic Fair News! The Fair will be here Sept. 3rd-12th. There is lots of fun planned. 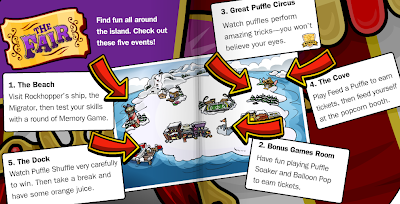 Visit Rockhopper's ship, the Migrator, then test your skills with a round of Memory Game. Have fun playing Puffle Soaker and Balloon Pop to earn tickets. Watch puffles perform amazing tricks - you won't believe your eyes. Play Feed a Puffle to earn tickets, then feed yourself at the popcorn booth. Watch Puffle Shuffle very carefully to win. Then take a break and have some orange juice. Rockhopper says he will be bringing "Magic Hats." And, of course, there will be Stamps to earn along with your tickets. You can redeem your tickets for awesome prizes. But, don't forget to spend your tickets before you log off or you will loose them. This Fair is shaping up to be one of the best eva! Are you getting excited for the Fair to begin? Check out my Skatepark on Planet Cazmo! i will get every thing i alredy earned up 20,000 coind forcatolog bye playing puffle round up for like 30 min yesterday to get 10,000then i played another like 30 for 20,000 im all redy for the fair! Hey thats tomorrow isn't it. You better tie everything down. Well CP did say that things will be coming out a little earlier now. Same here! I was just keeping up with penguin time. I'm always 3 hours ahead of pst. has anyone been able to log on? i will get every thing i already earned up 20,000 coins forcatolog bye playing puffle round up for like 30 min yesterday to get 10,000then i played another like 30 for 20,000 im all redy for the fair! One night, my stomach hurt (At midnight, so it was technically Friday), and I said I just needed something to eat. I got a bowl of cereal, brought it to the computer and checked the CP Catalog! I think they are all kind of the same, but they are still awesome! OMG! Be safe please! I might not you, but I want everybody to be safe! Awesome. I also think that for the green puffle! That would be cool! I think its gonna be in the next catalog. I will see in 2 minutes, which will be noon in PST! AAAH!The blizzard wizard was in that last picture! !